New York : Harper & Row, 1985, c1984. 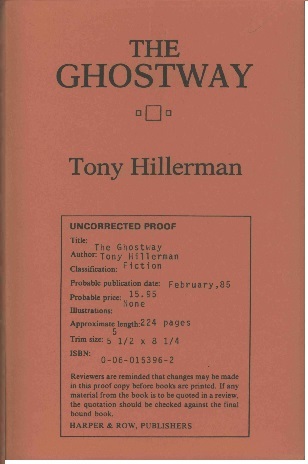 This is the advanced reading copy of The Ghostway, the sixth book in Tony Hillerman's Navajo Mystery Series and the third novel featuring the protagonist Sergeant Jim Chee of the Navajo Tribal Police. This uncorrected proof was published after the limited edition and may have been distributed in late 1984. Format: Paperback, 21.3 x 13.6 cm. Binding: Faded red paper covers printed in black reproducing typography of title and author from the title page. Centered below is publication information and a reminder to reviewers that this is an uncorrected proof. Spine lettering: [vertically] Hillerman THE GHOSTWAY HARPER | & ROW.